Note: This blog was written by Haleakala’s very own (former) foster mom. Haleakala and I met for the first time after our Executive and Adoption Directors rescued her from a shelter that Karma Cat frequently works with. After spending her entire two years of life at the shelter, Hale was beginning to “shut down” – she was becoming increasingly withdrawn and had stopped eating. Poor Hale was giving up on life and the kind people at the shelter thought we could give her a second chance. The beginning of my and Hale’s fostering story is a snowy one. In March, due to a massive impending snowstorm, all Karma Cats were evacuated from our adoption centers and made temporary fosters in volunteers’ homes. Hale was immediately welcomed into my home, where I was already fostering two timid kittens who luckily were a compatible fit with Hale. Once she arrived, Hale immediately ran into the crate and sat in the litter box. I pried her out twice and offered her the distinguished spot on the window seat pillow. She would have her own space above the kittens with a large window to peer out. I gave her calming drops and sat in the room with her and the kittens so they could get used to one another while supervised. The kittens and I played while Hale sat in the window, trembling and terrified. She was breaking my heart! I left the room to do a few things around the house, then peeked in to see how everything was going and I saw that one of the kittens, Sequoia, had jumped up to sit near Hale! I played with the second kitten, Joshua, but Sequoia wouldn’t leave Hale’s side. Looks like things were going to be OK for the temporary roommates! March 14, 2017 – BELLY! The next day it snowed like crazy and everyone had a quiet day watching the snow and sleeping – aka, being cats! When I popped in to visit the kitties, I saw that Hale was still trembling and terrified despite her calming drops. However, she seemed to become calmer as I pet her and brushed her, which gave me hope that she would learn to trust. 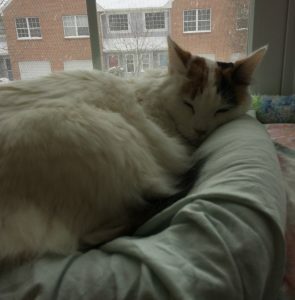 I had the option to take her back to our adoption center once the snow cleared but decided to keep her with me for a while longer until she became more comfortable with people. I’d say it was the right move because that evening after I spent a few hours playing with, petting and comforting her, I picked Hale up and put her in my lap and she allowed me to pet her, sing to her and even kiss her on the head! As I let her go, she slumped next to me so I could pet her and as I did, she began to roll over and showed me her belly! She looked relaxed for the first time since I had met her – it was so amazing that I had to capture it on video and share with the rescue volunteers on Facebook. As the days passed, Hale continued to stay on the pillow by the window. I fed her by bringing the dish up to her and she’d eat while I pet her head and held the dish for her. Sometimes I even gave her one morsel at a time to whet her whistle a bit and then she would eat more. She still trembled, but was increasingly receptive to petting and rolling around on the pillow as I pet and brushed her. She had even begun to interact with toys! It was a HUGE moment of happiness and I finally believed that she was going to be OK! March 20, 2017 – QUIET! 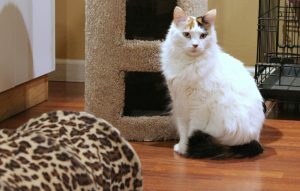 By the time the kittens left for surgery, it had been a week since Hale had arrived. I could pet her, hold her (briefly), play with her for a short period, feed her and have her roll around and show me she was more comfortable. Over the week, I noticed that she was much more receptive and relaxed – she came down from the pillow, perused around the room and seemed legitimately curious! It didn’t last long but it was enough to give me more hope. We played with toys and she rolled around, finally looking like a happy kitty. These improvements were especially encouraging because I had stopped giving her calming drops a day or two earlier because she had stopped trembling, which means we were seeing the “real” Hale. March 22, 2017 – Let It Go! …but the next morning I found her behind the TV again and I felt like all the work that had been done was erased. I worked with her to get her back up on the pillow in the window and hoped that when the kittens came home from surgery, she wouldn’t freak out. Fortunately she decided to let it go, because very shortly after she was back to herself – and we were back to working on being more social with both cats and people … and eating! My two other foster kittens had reached the point where they could move into our PetSmart adoption center and receive more exposure to people (and hopefully be adopted). While we love to foster all our kittens, the truth is that they aren’t seen in foster homes and PetSmart is the best place for them to find forever homes. So back at my house, Hale and I were on our own for now. Over the next few days, Hale became more trusting and confident. She roamed around, and sniffing the room and playing with toys on her own. I learned that the key to her happiness was being brushed so I spent time brushing her and petting her head and face until she was comfortable enough to jump down and play. She also ventured out of her room to explore my house, mainly at night. One night, she came out and sat on the floor of my bedroom. This was a milestone since it was the first time that she had come out and didn’t immediately run for cover. Unfortunately my cats were not enthralled by her presence, so she ended up retreating to her room but I could tell that she wanted to be with people and have company. It was time. She was ready for adoption. Sometimes the world makes sense and everything comes together in a way that you couldn’t write in a story. I received a text message asking if I could bring Hale to meet a potential adopter on Tuesday morning. I had to tell a small fib to get out of work to bring her for the “meet and greet” … and it was absolutely worth it. 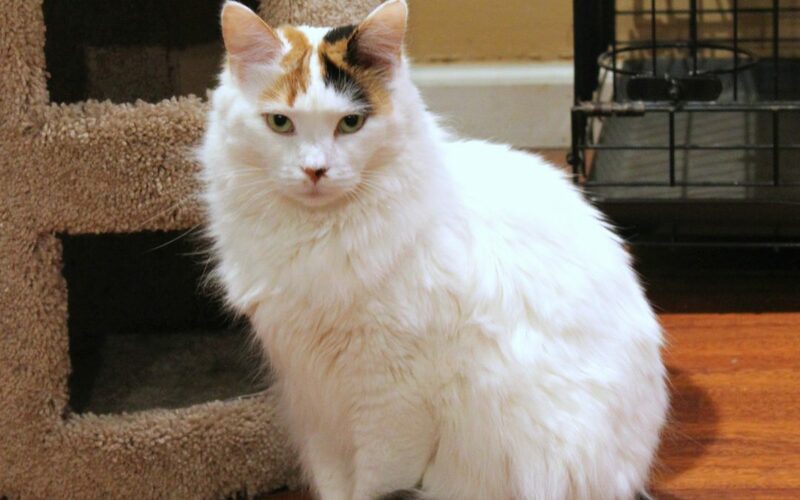 Her adopter was a previous cat owner who had recently lost her cat and was looking for a quiet lap kitty that would sit with her and give her love. I was worried that the drive would make Hale nervous but she sat down next to her potential cat mom and let her brush her, pet her and even give her a kiss. It was the most perfect match. 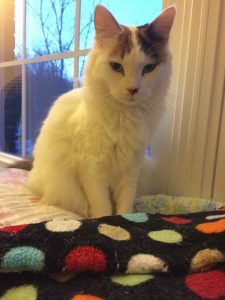 The best part was that the adopter understood that she’d need to be patient with Hale and work to earn her trust, and that she would be rewarded with a loving and affectionate kitty that had been saved from a life in a shelter. This is why I foster and volunteer – we literally save lives and bring happiness to people! Please consider joining our ‘ohana (family) of volunteers – apply here! Want to see the other amazing animals we have for adoption? Check them all out online!